Oklahoma Connection | Gill was born in Norman, Oklahoma, attended Oklahoma City's Cleveland Elementary School and graduated from Northwest Classen High School in 1975. Vince Gill gave his first public performance during the dedication of the Warr Acres City Hall at the age of 10. 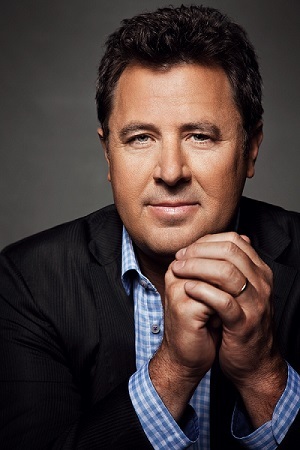 Oklahoma City’s country music superstar Vince Gill left soon after his high school graduation to pursue a career in music. He has received numerous Grammy Awards, two each for the popular songs “I Still Believe in You” and “Go Rest High on That Mountain,” as well as four Academy of Country Music Awards, and eight Music City News Awards. The songwriter and recording star has seven platinum and two gold albums. He has been named Male Vocalist of the Year, Entertainer of the Year, and Instrumentalist of the Year. He returns to Oklahoma often to participate in charity events, including his annual Vince Gill Celebrity Golf Tournament in Oklahoma City to benefit Special Care. Other beneficiaries are the Jimmy Everest Cancer Center and the Junior Golf Program in Oklahoma. In 1995 he participated in the Fourth of July show honoring the heroes who did so much in the aftermath of the bombing of the Alfred P. Murrah Federal Building in Oklahoma City and raised over a half-million dollars for the relief effort and the Red Cross. Other honors include induction to the Hall of Great Western Performers from the National Cowboy and Western Heritage Museum, induction to the Oklahoma Music Hall of Fame, Oklahoma City Public School’s Wall of Fame, the Minnie Pearl Award, VH-1 Award, and Outstanding Nashvillian of the Year. Mr. Gill was also the master of ceremonies for the dedication of the Oklahoma State Capitol dome in 2002.